You don’t want to check dozens of flights? It is enough if you know the date of your holidays, the departure place, the activity of your interest and the temperature. 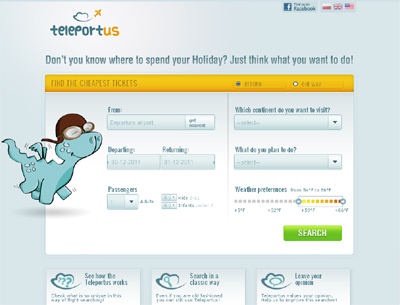 The Teleportus will search thousands of flights (heap airlines, regular airlines, charter flights) and find the cheapest flight for you! Simply, effectively and all for free! What is more, you will be able to buy the chosen ticket on our partners’ websites or save your search results. You can also search for flights using our traditional flight searcher.